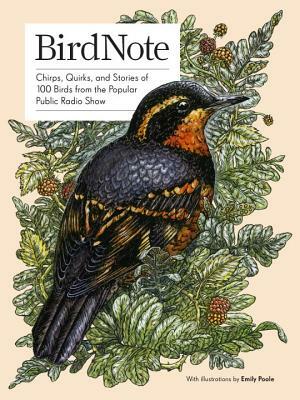 One hundred entertaining and informative essays from the popular public radio feature program, BirdNote, accompanied by original illustrations throughout--an illuminating volume for bird and nature lovers across North America. Ellen Blackstone is a writer, editor, and associate producer for BirdNote. She previously edited Earthcare Northwest, the newsletter of the Seattle Audubon Society and is a longtime member of the American Society of Crows and Ravens. Emily Poole is a freelance illustrator, born and raised in the mountain town of Jackson Hole, Wyoming. She graduated from Rhode Island School of Design with a BFA in Illustration and is currently located in Eugene, Oregon. She has created work for the Teton Raptor Center, World Wildlife Fund Guyana, and the National Museum of Wildlife Art. "…beautifully designed, with full-color illustrations and a handy bookmark tassel. This will make an excellent gift for the would-be birder in your family. And even veteran birders will enjoy it.…I recommend this book to anyone who loves birds (or anyone you think should love birds)."